COMPETITIVE ADVERTISING How do you compete against larger-sized ads on the same printed page? Bigger isn’t always better! While ad size may give you a competitive edge for more eyeballs on your ad, it can be meaningless if the message doesn’t match your brand’s image. This auto shop grabbed viewers’ attention not only through a generous dose of bright colors that matched the existing logo, but also through highly visual seasonal offers and graphic styling we provided to match the brand. Seasonal advertising brings fresh customers as well as long-timers to your door. Use the current holiday to reach out to clients and fans. 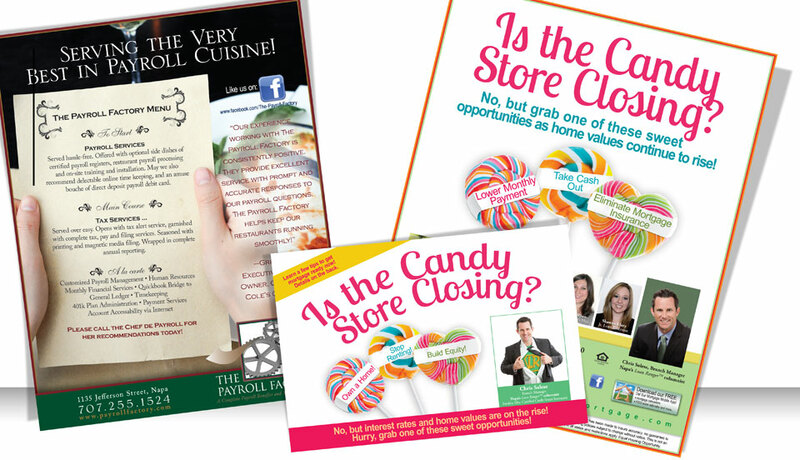 Each Cornucopia Creations’ ad is custom designed to meet the client’s specific needs. 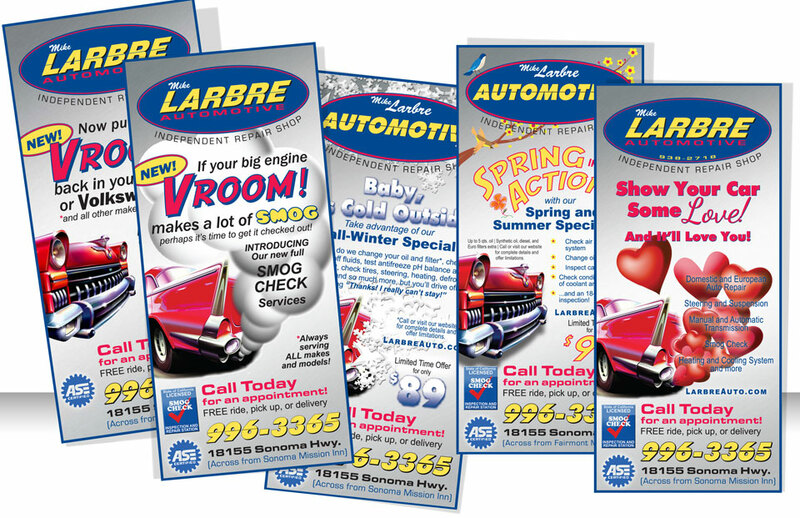 For this local auto repair shop, we crafted season-specific ads to remind existing customers of ongoing maintenance needs as well as draw new clients to his business. TRADITIONAL PRINT ADVERTISING Despite the success of various onlne marketing tools, traditional print venues, such as newspaper, magazine and postcard ads remain strong producers of new business. Ad design services include sourcing appropriate photography or illustrations, copywriting and overall creative direction to differentiate you from the competition. This client was specifically targeting restaurants for their payroll service. Challenges in marketing and design include creating eye-catching artwork for businesses that don’t have inherently visual products or services. This client supplemented a traditional print ad campaign with a postcard mailing, reinforcing the message.